University of Hawai‘i Press authors Gavan Daws, Eleanor Nordyke, Art Whistler, and Bob Dye will be among the writers attending the Daughters of Hawai‘i 4th Annual Book Day, Friday, November 6, 3:00-6:00 pm, at Queen Emma Summer Palace. Purchase books at a discount and get your copies signed in time for the holidays! All proceeds from the event will go to the Daughters of Hawai‘i, in support of their mission to preserve Queen Emma Summer Palace and Hulihe‘e Palace in Kailua-Kona. Refreshments will be served. There will be a special performance by the Queen Emma Summer Palace Ukulele Club and free tours of the Summer Palace will take place from 3:00-4:00 pm, so be sure to come early! More than 300 species of seabirds range across the world’s oceans. In excess of 14 million birds, representing nearly two dozen species, make their home in the Hawaiian islands. These are na manu kai, the birds of the sea. More than 135 color photographs illustrate Hawaiian Birds of the Sea: Na Manu Kai, by Robert J. Shallenberger. 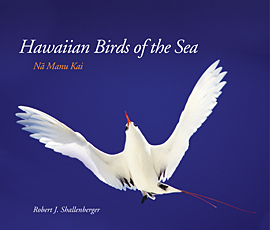 This beautiful book showcases the seabirds of Hawai‘i—from the far eastern tip of the Big Island to the recently created Papahanaumokuakea Marine National Monument. Hawai‘i is home to some of the most beautiful and sought after birds in the world. From the offshore waters, where graceful seabirds glide on the cool, refreshing trade winds, to the lush ancient forests of the mountains, where colorful endemic honeycreepers reside, Hawai‘i’s birds are wonderfully diverse. Introduced species and long-distance migrants contribute to the splendid assortment. Some island bird species are extremely abundant and instantly familiar since we encounter them daily in our outdoor activities. Others are so rare they are glimpsed only once in a lifetime. In these magnificent islands there is something for birders of every sort. Superbly illustrated in color by author Jim Denny and Jack Jeffrey, two of Hawai‘i’s best nature photographers, A Photographic Guide to the Birds of Hawai‘i includes nearly every species of bird on land and at sea in the main Hawaiian Islands. Jim Denny is also the author of The Birds of Kauai. Join the Hawaii Chinese History Center, the Associated Chinese University Women, and United Chinese Society of Hawaii in celebrating the publication of Chinese Pioneer Families of Maui, Molokai, and Lanai. Sunday, November 8, 1:00-3:00 pm, Kilauea Recreation Center, 4109 Kilauea Avenue, Honolulu: Co-editor Ken Yee and several of the oral history participants will be on hand to sign books. Festivities will include a lion dance, Hawaiian music of Maui and Molokai place-name songs, and simple refreshments. Please RSVP by email (ginny96825@yahoo.com) by October 30. Chinese Pioneer Families of Maui, Molokai, and Lanai is distributed by University of Hawai‘i Press. During the last half of the 1800s through the early 1900s Chinese migrated from their villages in the Pearl River Delta in Kwangtung Province (Guangdong) and many found their way to the neighbor islands in Hawaii. Chinese Pioneer Families of Maui, Molokai, and Lanai, edited by Ken Yee and Nancy Wong Yee, is a fascinating collection of oral histories filled with the voices of their children and grandchildren. They tell stories that are both universal and particular about the lives of the early immigrants and their families and how they adapted to their new home in the Hawaiian islands, even as they held fast to their ties to China. These colorful, multigenerational stories paint a larger picture of the cultural traditions and social life of that time and illustrate how these immigrants became part of the fabric of Hawaii. Reference materials and maps provide useful resources for those wishing to trace their own roots. Nationally acclaimed author Jon Shirota, whose Lucky Come Hawaii was the first novel by an Asian American Hawai‘i author to become a bestseller, will be back in the Islands for several public appearances sponsored by the Manoa Foundation. Lucky Come Hawaii will be released in a new, revised edition in late November by Manoa: A Pacific Journal of International Writing and University of Hawai‘i Press. Thursday, November 5, 3:00-4:30 pm: University of Hawai‘i at Manoa, Kuykendall Hall, Room 410. Shirota will talk on the Okinawan sense of place in his writings, including those in the latest Manoa journal, Voices from Okinawa. Thursday, November 5–Sunday, December 6, various times: Kumu Kahua Theatre, 46 Merchant Street, Downtown Honolulu. Performances of Shirota’s play, Voices from Okinawa. Monday, November 9, 5:00-6:00 pm: UH-West O‘ahu, Kuhialoko Lanai (E-Building). Shirota’s talk, “Akisamiyo! From a Pig Farmer to a Writer” will follow a reception at 4:00. This event is part of the Chancellor’s Lecture Series and is co-sponsored by the UHM Center for Okinawan Studies. Friday, November 13, 7:00 pm: Kapi‘olani Community College, Ohi‘a Building. “A Conversation with Jon Shirota” will be hosted by Chancellor Leon Richards; part of KCC’s International Week celebration. Entertainment by Okinawan dance and sanshin performers. Visit Voices from Okinawa Online for more information on Jon Shirota and his work.